Every suicide is a suicide bomber. The intention may be absolutely other—a yearning for peace, the need to escape, even a desire to spare the family. Nevertheless, the shrapnel flies. Five lines later we learn that Burroway's son, age 39, former soldier and army contractor, has shot himself in the head: "He’s gone," his wife tells us. The rest of the book, written in the years since his death, chronicles Burroway's grief but also the full arc of her son's life. Timothy Eysselinck was an army captain; a husband and father; a son; a friend; a hunter; and a humanitarian. He left his army career to become a contractor, continuing the work he had done as an officer: removing land mines. But he became discouraged with what he saw as the irredeemable corruption surrounding the war as well as the contracting business. Burroway, a former professor at Florida State University, is a highly accomplished writer, having published eight novels and numerous plays, poems, stories, and essays as well as the most widely used fiction writing text in America: Writing Fiction: A Guide to Narrative Craft. Losing Tim: A Memoir shows her at the height of her powers. Burroway and her son were political opposites for his entire life: she liberal, he conservative; she wary of guns, he an enthusiast; she against the war, he convinced of its necessity. "Many of his beliefs made me uneasy . . . Many of his enthusiasms were alien. But I accepted unease and alienation as part of the parental job description." This ability to see her son clearly as well as accept his differences allows her to write their story honestly—not shielding the reader from the brutality of war and the attitude of its soldiers—as well as reflectively—not letting grief alone cloud the larger story. She writes with raw honesty about the immediate aftermath of his death. When Tim's wife blurts out, "He did it in front of me! He did it in front of me!" Burroway takes "this in with a doubleness others have described: I absolutely believed her and also stood at a distance watching myself believe her, knowing it was all a mistake shortly to be explained." Later she described herself as "lunatic" and "deranged." But, she finds, "[b]ehavior carries you," and a semblance of normal life returns. She feels the let down of going through Tim's things—how "three crates from a storage warehouse . . . left paltry evidence of his rich existence." She starts writing a long-planned novel but winds up channeling versions of her experience: it is "full of death and dying" and becomes "autobiographical in a way I dared not then describe except through the scrim of fiction." And even as the months pass, a refrain continues to echo through her thoughts: "What is dead?" It still seems inconceivable that Tim is indeed dead and gone. Wars are fought over territory that mines make equally lethal for those who come to claim or reclaim, invade or build upon. The mine is a manufactured object with the express purpose of self-destructing and is hugely cost-effective. One can be bought for about the price of a Dove ice cream bar at an airport, but costs a thousand dollars to remove—which is one-third the price of a prosthetic limb. In some ways, a soldier returning from war feels similarly—if invisibly—mined. Burroway closes her book with a litany of suicides and other needless deaths surrounding the Iraq War; among the list of over 20 in the months surrounding Tim's death are Colonel Ted Westhusing's suicide; the contractors who were slain, burned and hung from a bridge in Fallujah; and Nick Berg, beheaded on video.
. . . all over the world is a slender web in space and time, of people whose lives were changed, or who were born at all, because my son who loved weapons went, by the hazards of history, into the odd profession of getting rid of them. And in that sense, there is no end to his story. Grief may be ongoing but so is love. 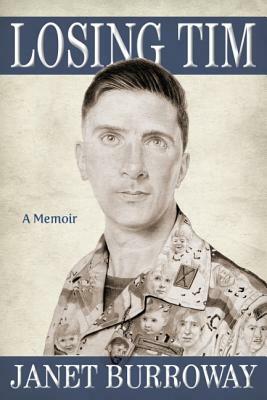 And Losing Tim: A Memoir—by turns generous, insightful, wrenching and loving—reveals the intricacies of this relationship both in life, with all its messy loves and losses, and in death, its nonnegotiable finality.